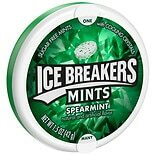 Shop Ice Breakers Sugar Free Mints in Spearmint Spearmint (1.5 oz. )1.5 oz. 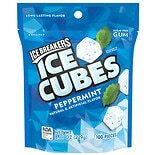 2 for 4 dollars and 00 cents or 1 for 2 dollars and 29 cents $2.59 $1.53 / oz. Shop Ice Breakers Sugar Free Mints in Wintergreen Wintergreen (1.5 oz. )1.5 oz. 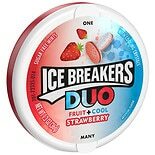 Shop Ice Breakers DUO Strawberry Flavored Mints Strawberry Flavored (1.3 oz. 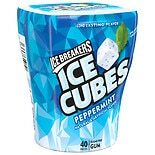 )1.3 oz. 2 for 4 dollars and 00 cents or 1 for 2 dollars and 29 cents $2.59 $1.76 / oz. 2 for 5 dollars and 00 cents or 1 for 3 dollars and 49 cents $4.49 $1.08 / oz. Shop Ice Breakers Ice Cubes Sugar Free Gum Cinnamon (3.24 oz. )3.24 oz.